Thanksgiving is over… onto the next holiday! Seriously kidding, but doesn't it seem that the holidays come around earlier & earlier each year? Well, Christmas… bring it on! I have my Christmas list made up (with all the Black Friday deals scoured here) & plotting holiday attire now too. 1 part totally cheeky tacky sweater + a heavy handed helping of sparkle. Because my sponsors LOVE you guys, they are hooking everyone up with some sweet discounts & one lucky duck will take home a giveaway prize too! Enjoy 20% off from Skip N' Whistle to pick up your own tacky sweater tee, now until December 25 (code SANTA). Not only does Yuni Kelley has a 20% coupon code for you guys that never expires! (code HERENOW), but the shop owner is hosting a giveaway for a shop credit too! Wow! what a bright and attractive ensemble....I love that sweater. Love this spike bracelet so much! My favorite is the Mint Geo Pendant thanks! Love the 18k gold and crystal bangle! I love the blue and crystal statement necklace! Love the bracelets! Especially the silver pave ball clasp. Love the Petite Crystal Brulee Bracelet! Such a fun outfit! Love the pave link bracelet. The chunky rose gold bracelet is lovely. 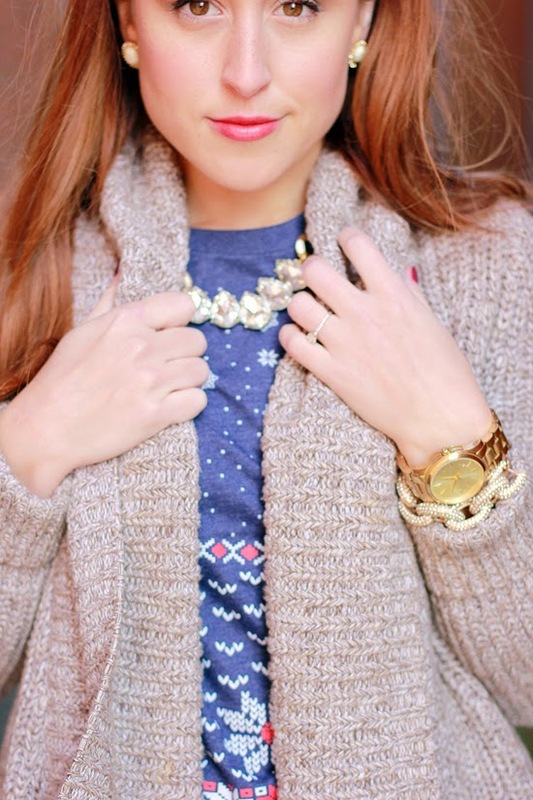 I love the Oversized Chunky Rose Gold Necklace! The original gold chain bracelet is gorgeous! You look great!! Love all the sparkle! For the giveaway, I'm in love with the petite crystal brulee bracelet! Love Yuni Kelly! The crystal pave bracelet and mini brulee are probably my favs! Red Rosette Statement Necklace is my favorite items. I love your sweater. I hope you have a great weekend. I love the Crystal Bib Statement Necklace! gold crystal pave link bracelet! I like the Amethyst Purple Gem & Gold Chain Bracelet! I've been looking for a good sequins skirt for awhile now! You look fab. And, I love the giveaway. I would definitely get the crystal teardrop bib necklace. Crystal Teardrop & Gold Chain Necklace! The crystal brulee bracelet or the teardrop necklace are stunning! Love how you paired your tee with the sparkley skirt! You look so pretty here! I wouldn't have thought to pair these together, but you look great. I agree- it seems like Christmas is earlier every year! i really adore the mint geo pendant! That tee is so cute! I've got a few things from Julie's shop, but I've been really thinking about getting the Venus Flytrap necklace too! The oversize rose gold chain necklace! Your sweater looks so luxurious and warm! So pretty! Jessica, your sweater is so beautiful! It looks so luxurious and thick. I love the boston terrier gray sweatshirt! The rose gold pave ball clasp bracelet! My favorite item is the Petite White Turquoise Spike Necklace. It is so simple and delicate. Like the rose gold page heart necklace! I like the Red Rosette Statement Necklace. Well, I can totally see why the "Crystal Brûlée Necklace" is backordered… it is solo pretty. I think I'd hold out for it! I like the Red Rosette Statement Necklace! I love the Crystal Teardrop and Gold Chain Necklace! I like the Petite Crystal Brulee Bracelet! I really want the venus flytrap necklace! I love the mint and crystal statement necklace! Gorgeous! I love the Crystal Bib Statement Necklace! I also love your sequin skirt! I love the white&crystal statement necklace! So many gorg pieces though. And that t-shirt is hilarious. I cannot get enough cute/funny graphic tees. These pictures are stunning Jessica! 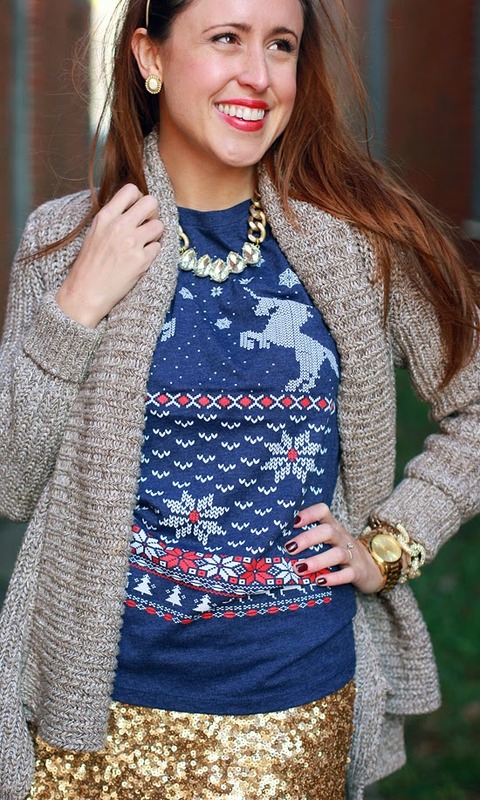 Such a fun holiday look! I'm loving the chunky gold chain necklace from their shop! I love her shop, and love everything! But at the top of my list are the Petite Crystal Brulee Bracelet and the Rose Gold Pave Ball Clasp Bracelet!